Many of our patients look back on their decision to improve their smile with All-on-4 dental implants and are so happy they made that choice. If you’re considering this effective implant-retained denture option, our Coral Springs dental team is here to help. Dr. Pinero will be with you every step of the way! At Dental Wellness Team, we provide customized All-on-4 tooth replacement services to help meet the lifestyle needs of our patients. Everyone’s smile is unique, so we work diligently to create one-of-a-kind solutions that feel natural and give each patient a beautiful smile. With All-on-4 dental implants, you can enjoy a brand new smile in just one day. 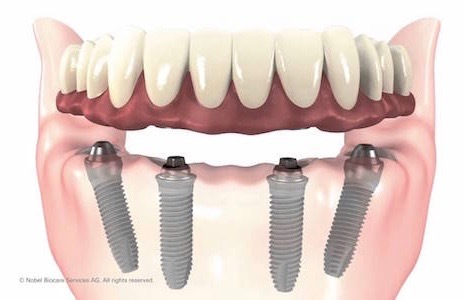 All-on-4, often also referred to as “Teeth in a Day”, is a treatment concept that rehabilitates an arch by precisely placing four implants to support a permanent, fixed denture. Implant-retained dentures like this offer many benefits over conventional dentures. The titanium material of the implant integrates naturally with your bone, stimulating bone regeneration and keeping your jaw stronger and healthier. As a side benefit, this process also helps your face stay more youthful looking! Implant-retained dentures are secure and won’t slip, allowing you to eat and talk without worry or discomfort. Are All-on-4 Dental Implants Right For You? Dr. Pinero widely recommends All-on-4 dental implants to many of our Coral Springs patients, as they tend to have excellent treatment outcomes. Patients who are good candidates can be back to enjoying use of their teeth in just one day! First, Dr. Pinero will evaluate your jaw for bone density to ensure it is healthy enough to support the loading of dental implants. Then, we will take a deep look at your oral anatomical structures to determine exactly where to place your dental implants. After this careful surgical planning, it will be time for Dr. Pinero to surgically place your new dental implants. During surgery, he will attach temporary teeth to your implants by using abutments, giving you teeth on the same day as surgery! During the 6-8 week healing process, we recommend going easy on your new teeth so you don’t suffer any setbacks on the road to receiving your permanent teeth! Schedule Your Dental Implants Consultation With Dr. Pinero Today! If you think All-on-4 dental implants could be the tooth replacement solution for you, give our Coral Springs dental practice a call. A consultation with Dr. Pinero is the perfect way to answer all of your questions and determine if dental implant retained dentures could be the best solution for your smile! With all of our restorative dentistry treatments, you can smile with confidence again!